As part of CAIDA’s ongoing research into Internet topology mapping, we have been working on improving our ability to geolocate backbone router infrastructure. Determining the physical locations of Internet routers is crucial for characterizing Internet infrastructure and understanding geographic pathways of global routing, as well as for creating more accurate geographic-based maps. Current commercial geolocation services focus predominantly on geolocating clients and servers, that is, edge hosts rather than routers in the core of the network. 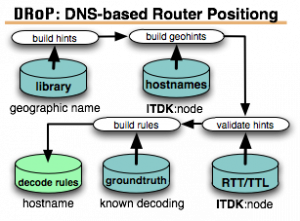 Figure 1, shows the inputs and steps used by the DRoP process to generate hostname decoding rules. In a recent paper, DRoP:DNS-based Router Positioning, we presented a new methodology for extracting and decoding geography-related strings from fully qualified domain names (DNS hostnames). We first compiled an extensive dictionary associating geographic strings (e.g., airport codes) with geophysical locations. We then searched a large set of router hostnames for these strings, assuming each autonomous naming domain uses geographic hints consistently within that domain. We used topology and performance data continually collected by our global measurement infrastructure to ascertain whether a given hint appears to co-locate different hostnames in which it is found. Finally, we combine geolocation hints into domain-specific rule sets. We generated a total of 1,711 rules covering 1,398 different domains, and validated them using domain-specific ground truth we gathered for six domains. Unlike previous efforts that relied on labor-intensive domain-specific manual analysis, our process for inferring domain-specific heuristics is automated, representing a measurable advance in the state-of-the-art of methods for geolocating Internet resources. Figure 2, shows how users interact with DDec to decode hostnames. In order to provide a public interface and gather feedback on our inferences, we have developed DDec. 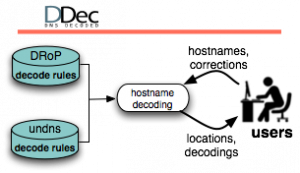 DDec allows users to decode individual hostnames, exmaine rulesets for individual domains, and provide feedback on rulesets. In addition to DRoP’s inferences, we have also included undns rules. For more details please review the paper or the slides. This entry was posted on Saturday, September 6th, 2014 at 11:42 am	and is filed under Commentaries, Measurement, Updates. You can follow any responses to this entry through the RSS 2.0 feed. You can skip to the end and leave a response. Pinging is currently not allowed.